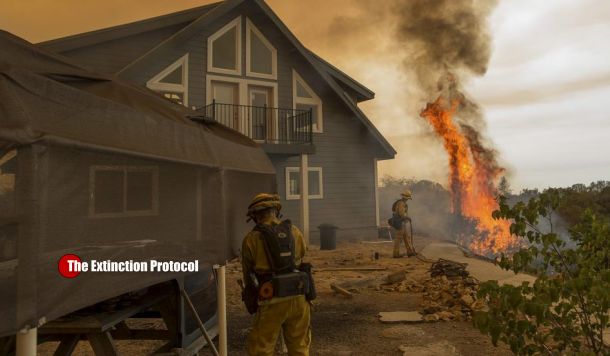 September 2015 – CALIFORNIA – Hundreds of people were forced to evacuated on Friday as a Northern California wildfire threatened rural communities, destroying six homes, threatening thousands more and prompting the governor to declare a state of emergency. “It’s expanding like a balloon,” state fire spokeswoman Nancy Longmore said. “It’s moving very fast. There’s many homes threatened…This fire is extremely dangerous.” The slow-moving fire managed to burn about a single square mile on Thursday. However, the fire exploded, burning 101 square miles by Friday evening. It was only 5 percent contained. At one point, the blaze was bearing down on the 2,700 residents of San Andreas, prompting an evacuation order for the entire town 60 miles east of Sacramento. However, the fire would change direction, and the order was called off a short time later, state fire spokesman Daniel Berlant said. “The fire was quickly approaching the community,” Berlant said. “This fire is very dynamic and changing different directions with the topography… That makes it very unpredictable, and with the exponential growth, we’re seeing a lot of danger not only to residents in the path of this fire but to our own firefighters, as well.” San Andreas residents were still told to prepare to leave just in case the fire turned around again. At least 460 residents from surrounding towns were under evacuation order and moved to evacuation centers for the night. One of those evacuation centers was at the San Andreas Town Hall, which itself had to be evacuated for a while. “I had to move a kitchen full of food, 217 beds, three huge air conditioners,” said Gina Gonzales, a Red Cross volunteer organizing the evacuation center. About 90 minutes after moving everything to the Calaveras County Fairgrounds, Cal Fire ordered the evacuation center to move back to the San Andreas Town Hall because firefighters were planning on making the fairgrounds their base camp, Gonzales said. The lack of communication being given to the evacuees angered some residents, she said. Six homes and two outbuildings burned Thursday, and 6,000 more were threatened, Longmore said. The number of homes burned could increase, as Longmore said the blaze was moving through rural areas with houses. “The plan is to try to get this thing out,” she said. “It’s going to take quite a bit of work. We’re in for the long haul here.” Gov. Jerry Brown declared a state of emergency, helping to free up funding and resources in the firefight. More than 1,500 firefighters, 178 engines and seven air tankers and 16 helicopters were dispatched to fight the fire, which began Tuesday. The cause of the fire is still under investigation. Meanwhile another California wildfire threatened to sweep through an ancient grove of Giant Sequoia trees. The lightning-caused fire has charred 172 square miles and grew by nearly 40 square miles in the last week. In a fight to save the trees, firefighters have been clearing lines with bulldozers around the Grant Grove and putting up sprinklers, said Andy Isolano, a spokesman for the Clovis Fire Department. This entry was posted in Catastrophic Insurance losses mount, Civilizations unraveling, Earth Changes, Earth Watch, Electric power disruption & grid failure, Health guideliness issued, High-risk potential hazard zone, Human behavioral change after disaster, Potential Earthchange hotspot, Prophecies referenced, Time - Event Acceleration, Wildfires. Bookmark the permalink. I am so sick of the fires here in northern California! we live in lake county and yet another huge out of control fire has struck our county today. I am so glad they are really making a stand for the old sacred grove,Lordy will there be anything left? pray for the planet!! You know what’s the worst part of leaving, the crooks will come in and ransack your home while your gone. It’s happened a lot of times and the news media doesn’t like to cover that. HIS fury is going forth like fire. Fire, drought, radiation on the west – doesn’t that look like judgement? well… except for the fact that so far the folks being impacted the worst are just regular working class folks who are living a struggle. so, HIS aim is bad? I see what is happening on the west coast. Radiation, eco-system is breaking down with lots of animals dying (birds, deer, seals, sea-stars, etc. ), the forests are burning like never before. Evil is coming out from over there (Hollywood alone). I see the fire, I read GOD’s word. Knowing those people’s heart? I don’t know. Do you? At this current moment people are not dying. HE is knocking, calling, etc.